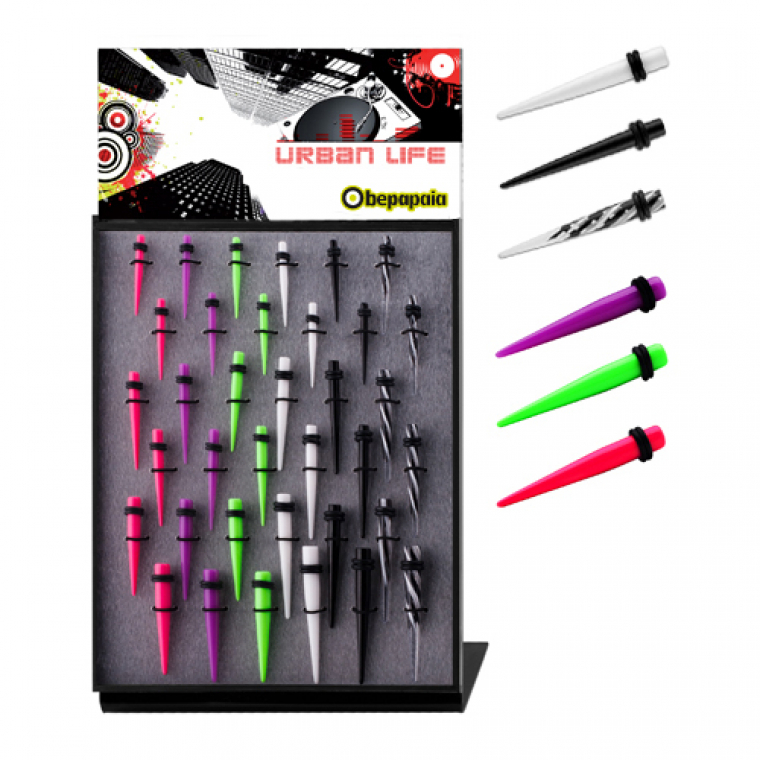 Wholesale Jewellery and in Outlet. 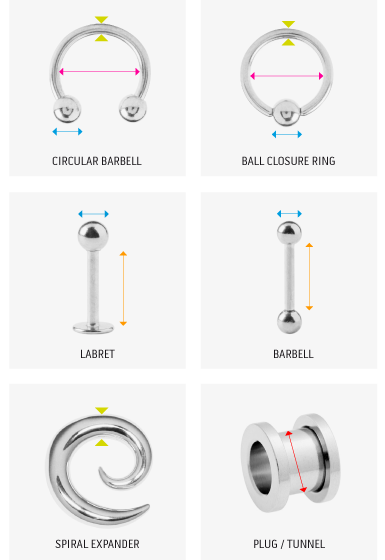 To find out the size of a piercing you want, you have to consider 3 measurements: the width of the bar, the diameter and the diameter of the ball. For example, for a hoop with 2 balls you have to measure the interior diameter of the hoop and the width of the bar itself. 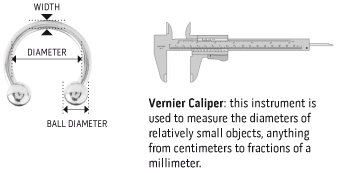 To measure these accurately you need a caliper. On our website you will see measurements such as: 1.2x8x3. The first number corresponds to the width of the bar, the second to the diameter of the piece and the third refers to the diameter of the ball. Click to view video. 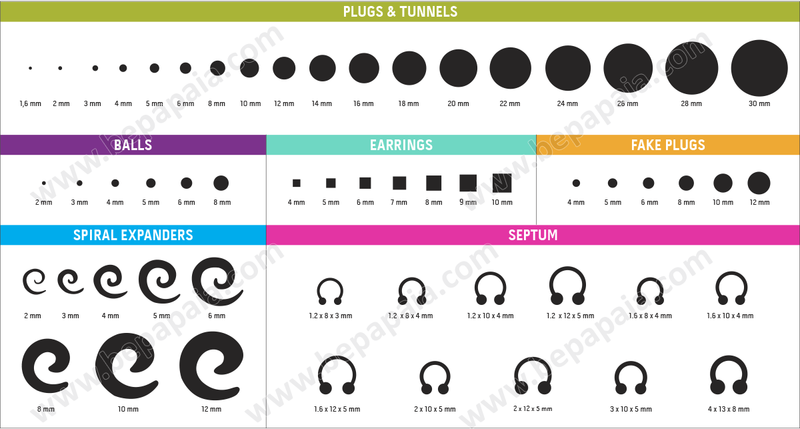 In other cases like with the ear plugs and the expanders, you only need to consider the diameter. Click to view video. 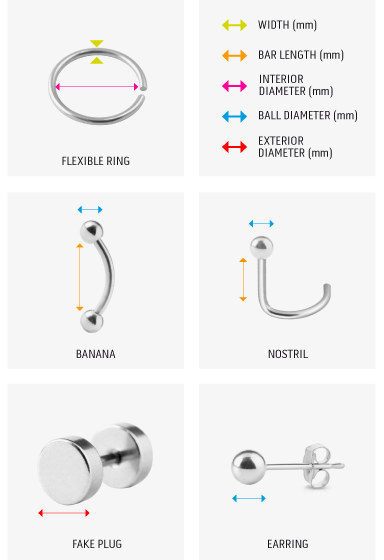 With earrings, you just need to measure the size of the ball, stone, gem etc. 10€ for Spain (Mainland), 15 € for Balearics and 35 € for Canaries, Ceuta and Melilla). They will be sent using NACEX. 25€ for Europe and will be sent using UPS. 60€ for outside Europe will be sent using UPS. National deliveries (inside Spain) take 1 or 2 working days. International deliveries (inside Europe) take 2 or 3 working days. International deliveries take between 7-10 working days. If you place an online order on a Friday after 12 noon, you will receive your order, at the earliest, on the Monday of the following week. You will receive an email confirming the shipment of your order and a tracking number so as you can follow the status of your package. All shipments will only be dispatched after we have received payment confirmation. (1) DUA and IGIC not included, it will be at the customer's expense. (2) IGIC not included, it will be at the customer's expense. You can pay directly with your credit card; both Visa, Mastercard and American Express are accepted. When you have placed your order, choose the Credit Card option, type in the card number, we will then safely and securely authorise the payment with your bank. There is a minimum order in 100€. Orders cannot be dispatched until payment confirmation has been received. Once we have checked that the payment has gone through, your goods will be shipped. Just make a transfer for the amount of your order to our Bepapaia bank account. Santander Bank: ES13 0049 1363 0427 1033 2376 or SWIFT: BSCHESMMXXX CaixaBank: ES61 2100 0681 0002 0032 9017 or SWIFT: CAIXESBBXXX. Once you have done the transfer, please send us a copy of the receipt so we can confirm your payment and dispatch your goods. If you feel comfortable making your online purchases through Paypal, you can use the same payment method to buy your goods from Bepapaia. If you don’t already know about Paypal, you can use this link to find out more about making fast, easy and secure online payments. Once you have completed your order, you will have the option of paying with Paypal. When you click on this option a Paypal portal will appear where you can enter your details and transfer the amount into our Bepapaia bank account. How do I create a Bepapaia account? Can I buy from Bepapaia if I'm not a user ? Why do I have to register as a user? How can I restore my username or password? How do I log on to Bepapaia? How can I change the details of my Bepapaia account? Can I make an order over the phone? Can I track my order/How can I find out my order status? What type of deliveries do you offer? I've received an item I didn't order or a damaged one, what should I do? There are items missing from my order, what should I do? What happens if the product I ordered is out of stock? My order hasn't arrived yet, what should i do? How do I know if you have sent the order? If I received my order with FEDEX, do I have to use the same courier to return my order? What is 'My Wish List'? How can I get a discount voucher? Can I buy loose items, instead of buying displays stand? I cant' find the right answer to my question, how do I get in touch with customer services? 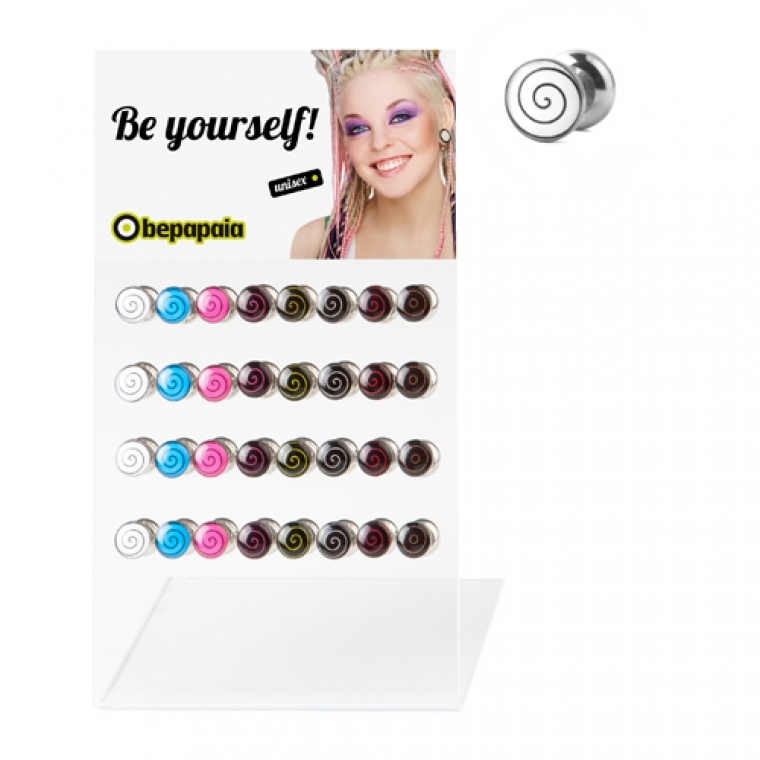 - How do I create a Bepapaia account? Easy, first go to 'Register'. Fill in the details asked for on the registration form. Once you’ve completed the registration and we have received your details, you will get an email with your Bepapaia username and password. - Can I buy from Bepapaia if I’m not a user? 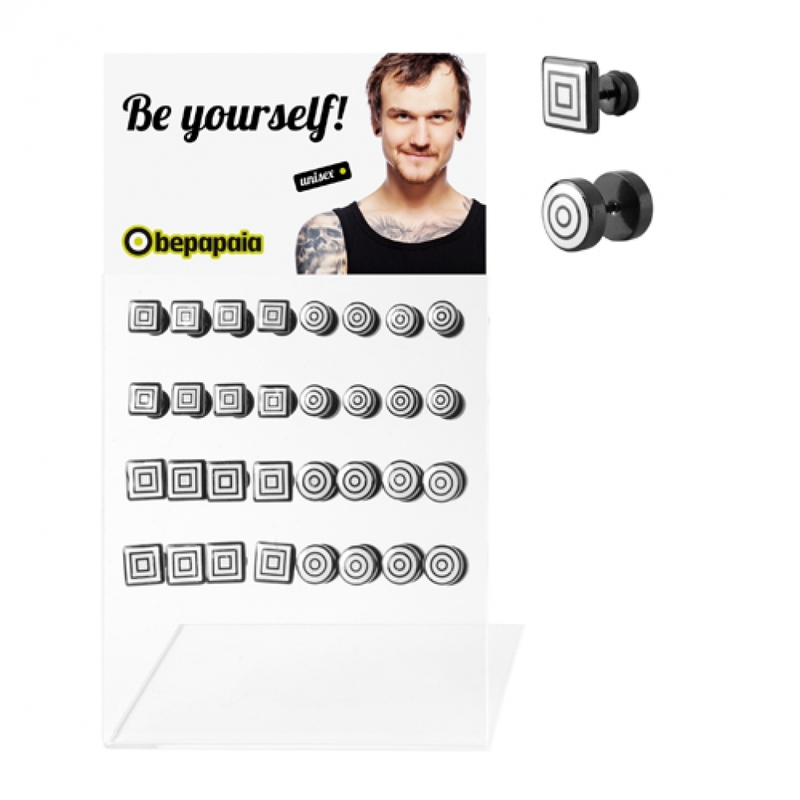 No, to buy online you have to create a Bepapaia account. It’s quick and easy but should you have any questions, just go to our 'How to create an account'. - Why do I have to register as a user? Bepapaia is a website dedicated to businesses and professionals, that’s why we have to verify your details. - How can I restore my username or password? If you have forgotten your username or password don’t worry, just go to the 'Sign in' section and type in your email and we’ll send you steps on how to get them back. - How do I log on to Bepapaia? The next time you want to shop online you can go directly to 'Sign in' and type in your username and password. You have to be registered with us before you can make a purchase. Go to 'Register' to make an account. -How can I change the details of my Bepapaia account? If you want to change any of the account details, simply go to 'My Account' and click on 'Edit'. - Can I change my delivery address? Yes, of course. If you want to change the address or any other detail in your account, simple go to 'My account' and click on 'Edit'. - Can I make an order over the phone? Yes, you can call our sales team during opening hours and place an order with them. You’ll find everything you need in 'Contact'. - Can I change/cancel my order? If you would like to change or cancel your order, get in 'Contact' with us by either email or phone and we’ll happily sort the issue out. In reference to a return/refund, please have a look at our 'Return/refunds policy'. - Can I track my order?/ How can I find out my order status? If you want to find out the status of your order, go to 'My account' then to 'My orders'. You will also receive a tracking number by email. - What type of deliveries do you offer? To find out more about the different national and international delivery methods we offer, have a look at our 'Delivery information' section. - I received an item I didn't order or a damaged one, what should i do? Should you receive any item which is incorrect, missing, defected or damaged, get in 'Contact' with us by email or phone and we will happily sort the issue out. - There are items missing from my order, what should I do? - What happens if the product I ordered is out of stock? If the item you want is out of stock, first you will receive an email advising you, then you can either replace the item with another of the same value or we can refund the amount of the order. For more information, have a look at our 'Returns/refund policy'. - My order hasn’t arrived yet, what should I do? You can check the order status online by going to 'My account' then to 'My orders', follow it using the tracking number we sent you by email or you can always get in 'Contact' with us and we will happily sort the issue out. - How do I know if you have sent the order? When your products are dispatched, we will send you an email confirming your order is on its way with an expected delivery date. If you want to check on the status of your order at any time, you can go to 'My account' then to 'My orders'. - How do I return an item? Send us an email with your reason for returning the product and once we have confirmed receipt of this email, you can parcel it up, preferably in its original packaging, using a box or a padded envelope. Please take care to wrap the items well as we will not be responsible for any items which arrive damaged due to bad packing and the return/refund will not be processed. Include a copy of the order form. Send us an email confirming that you have sent the parcel back to us and keep the receipt of postage until you have received the new goods or a refund. IMPORTANT: Neither the cost of the services nor of the original shipment will be refunded. We only cover the costs for items returned due to defects/damage. If you have any questions regarding this process, more information can be found in our 'Returns/refunds Policy'. - If I received my order with FEDEX, do I have to use the same courier to return my order? Even though you have received your order from FEDEX, you can return it using any courier service you like, however we do recommend you send it back by a certified post service. - How long will it take to receive my refund? Once we have received your order, the refund takes between 5-7 working days to be processed. More information on this can be found in 'Returns/refunds Policy'. - What payment methods do you offer? You can pay directly with your credit card; Visa, Mastercard and Anerican Expresss are accepted. When you have placed your order, choose the Credit card option, type in the card number, we will then safely and securely authorise the payment with your bank. There is a minimum order in 100€. Just make a transfer for the amount of your order to our Bepapaia bank account. Santander Bank: ES13 0049 1363 0427 1033 2376 or SWIFT: BSCHESMMXXX. Once you have done the transfer, please send us the receipt so we can confirm your payment and dispatch the goods. Orders cannot be dispatched until payment confirmation has been received. Once we have checked that the payment has gone through, your goods will be shipped. - Is there a minimum order? Yes, for both national and international orders, there is a minimum order of 100€. - What is 'My Wish list'? This is where you can save all the Bepapaia items you like and then choose the ones you want to buy at the end. You can access the products in 'My Wish list' whenever you want, just click on the 'My Wish list' button at the top right of your screen. To include any item from the list in your basket, simply click on the 'Add to basket' button found next to the product. - What are the delivery costs? - How do I use my promotional code? Once you have chosen the products you want to buy, in 'My basket' you will see a box where you can type in your promotional code. Type carefully, as all codes are case sensitive. Then you can complete your order. The promotional codes have expiry dates and can only be used when they are valid. Some codes can be used once and others more than once so have a look at the conditions of each voucher. - How can I get a discount voucher? You can get our promotional codes through our social networks, if you are a fan or if you subscribe to our Newsletter. 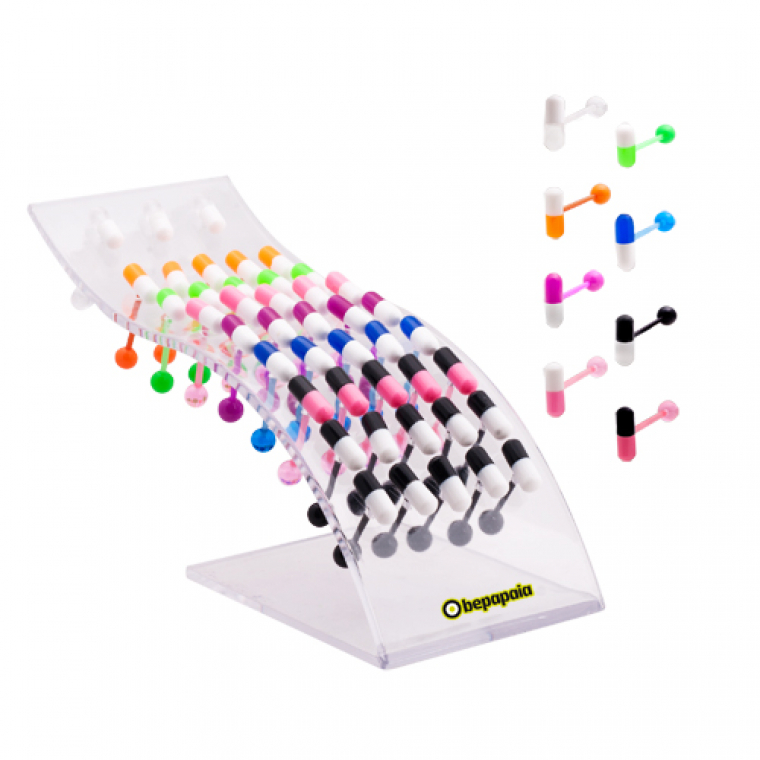 - Can I buy loose items, instead of buying displays stand? Yes, it’s possible. Send us an email or give us a call and we’ll see if we can offer you this service. - I can’t find the right answer to my question, how do I get in touch with customer services? For any other questions you might have, get in 'Contact' with us, send us an email or give us a call. Our team would love to help you! Woops! You’re not in Europe!